Our 50 hp TLDI® outboard is leading the way in new technology! 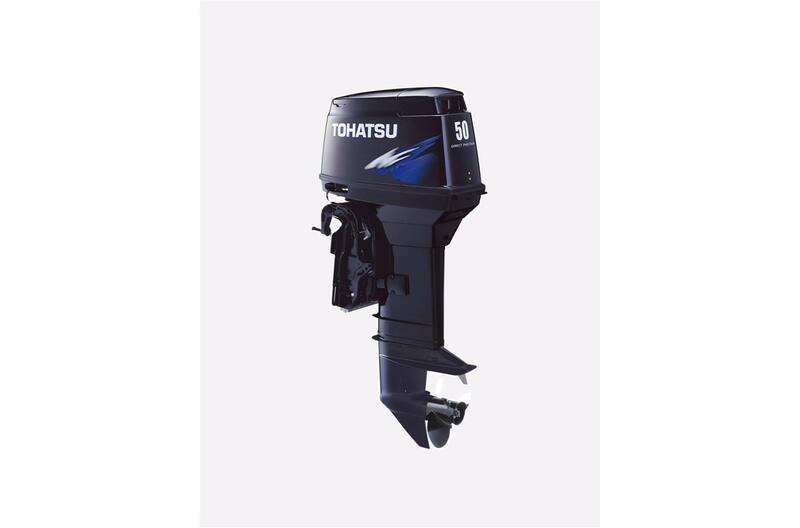 The Tohatsu 50hp TLDI® is one of the smallest outboards on the market with air-assisted, direct fuel injection. This outboard provides exceptionally smooth operation and outstanding performance all the while providing superior fuel and oil efficiency. This outboard is every boater's dream. Tohatsu even won the Motorboating magazine's “Editor's Choice Award" for this new outboard! The 50 hp TLDI® is heralded as the outboard to buy for the 21st century! We have added this new low-pressure air/fuel delivery system to our proven engine block to give you an outboard that is cleaner for the environment while also giving you the exceptional performance you expect from a Tohatsu. This engine provides lower oil and fuel consumption in a compact yet powerful outboard package. Our 50 hp TLDI® weighs up to 15% less than competitive 4-stroke outboards and meets all EPA emission regulations. If you're looking for a tiller model, we now offer a multi-function tiller handle as standard equipment. This tiller handle includes all controls conveniently located on the handle for easy access giving you more control, better maneuverability and increased safety. The 50hp TLDI® combines award-winning technology with proven dependability to offer you this truly unique outboard! Multi-Function Tiller Handle is available on select models. : The multi-function tiller handle features an ergonomically designed shift lever for easy and convenient shifting as well as a longer throttle grip with 110 degrees rotation for easier maneuverability. All controls on the new multi-function tiller are conveniently located on the handle for easy access and control. More specifically, the gear shift, throttle control, trim switch, safety lanyard cord, TLDI® warning lights, and electric start key switch are all integrated in the tiller handle. Engine Control Unit (ECU): The 32 bit engine control unit controls the fuel injection and ignition timing for TLDI® outboards. Air Compressor: One of TLDI®'s essential engine components that is the driving force in achieving stabilized fuel injection. Direct fuel Injection into Cylinders: Due to the intrinsic design of the chamber on the cylinder head, the finely atomized fuel mist created by the fuel injector is injected near the spark plug to achieve ideal combustion. 3-Step Trolling Speed Control: The idling speed can be set to any of the three rpm ranges, 700, 800 or 900, by adjusting it on your key switch. This feature allows you to select the ideal trolling speed for maneuvering during a variety of current and wind conditions. Propeller Selection Range: 7 in. - 15 in. * Weight specification is based on the lightest version. Specifications and descriptions are subject to change without notice.